This year ESPN devoted three weeks — six full hours — to their coverage of the $1,000,000 Big One for One Drop, whetting poker fans’ appetities for their upcoming coverage of the Main Event starting later next month. During the coverage one hand earned a great deal of notice from the mainstream audience, while another continues to fascinate in particular the poker community. 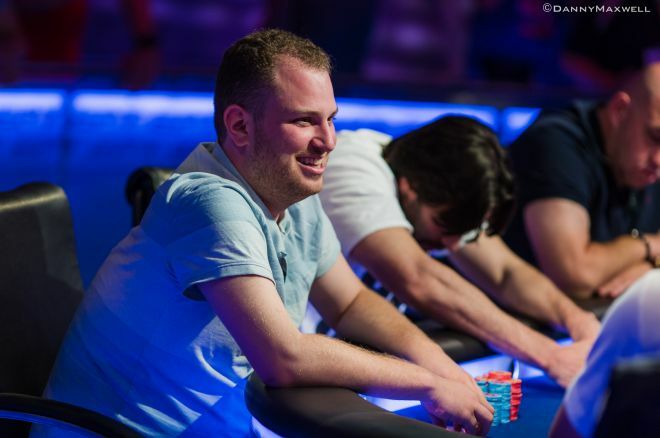 From the first week of coverage the hand in which Connor Drinan was eliminated with versus Cary Katz’s when four hearts came among the community cards earned a huge amount of attention. Of course for poker players the aces-versus-aces hand — though intriguing, for sure — didn’t present too much in the way of strategy to contemplate. Drinan and Katz were more or less assured of getting all of the chips in the middle before the flop with those hands, their fates then being out of their control as the community cards came. This Reinkemeier vs Seiver 1drop hand is one of the wildest moments in poker TV history right? @AFeldmanESPN @efropoker @scott_seiver was actually the best poker related thing I’ve ever watched. “What a playa"
Hand #13: Scott Seiver raised to 1.2 million from the hijack, Tobias Reinkemeier defended his big blind, and the flop fell . Reinkemeier checked, Seiver bet 1.5 million, and Reinkemeier called. The turn was the . Reinkemeier checked, and Seiver moved all in for 6.825 million. The German tanked for the better part of three minutes before standing up out of his chair, then sitting down once again. Reinkemeier hung his head over the back of the chair — he’s sitting in it backwards — and cocked his head as he stared down Seiver. The two exchanged light words, then both chuckled. The tank continued for a few more minutes. Reinkemeier did his best to get anything he could out of Seiver, but he didn’t budge. Finally, the clock was called, and 55 seconds later Reinkemeier folded, saying he had aces. "There's NO way you had aces!" Seiver objected. Reinkemeier pulled his cards back and indeed revealed two aces — we believe they were the — and mucked them once again. Seiver showed the bluff with the . It was a remarkable play by Seiver, what could be qualified as a “semi-bluff” as he did have an open-ended straight draw when he shoved. But it was his table talk and convincing appearance of being much stronger than he was that ultimately encouraged Reinkemeier to fold. If you’re curious, ESPN has also posted that hand on YouTube. Meanwhile PokerNews Remko Rinkema was able to catch up with Seiver recently at EPT Barcelona to talk to him about the hand. Watch as Seiver explains what he calls “one of the wilder hands” he’s ever played.